Blurb: Detective Lindsay Boxer’s long-awaited wedding celebration becomes a distant memory when she is called to investigate a horrendous crime: a teenage girl is badly injured and left for dead, and her newborn baby is nowhere to be found. Lindsay discovers that not only is there no trace of the criminal – but the victim may be keeping secrets as well. At the same time, Assistant District Attorney Yuki Castellano is prosecuting the biggest case of her life – a woman who has been accused of murdering her husband in front of their two young children. Yuki’s career rests on a guilty verdict, so when Lindsay finds evidence that could save the defendant, she is forced to choose. Should she trust her best friend or follow her instinct? Lindsay’s every move is watched by her new boss, Lieutenant Jackson Brady, and when the pressure to find the baby begins interfering with her new marriage to Joe, she wonders if she’ll ever be able to start a family. Review: This was a really good book. But my goodness, edit edit edit! There were grammatical errors in this book, which isn’t usually something I come across in a James Patterson book. I understand that these things happen, but if I can spot them it always makes me wonder if anyone even edits/reads these books anymore! Spell check doesn’t catch everything! Anyway, grammar issues aside, I felt like this was a good read. I enjoyed the two plot lines that were going on. I enjoyed more character development with Lindsay and Joe and Yuki’s new relationship as well as Cindy and Conklin’s relationship progression. It’s always like getting together with friends when I read this series. I really like this series, and although I prefer the Alex Cross series, this is another one of my favorite series that I would highly recommend. First Line: Sarah Wells stood on the roof of the carport and snaked her gloved hand through the hole she’d cut in the glass. A young mother and her baby are gunned down while leaving a shopping mall. There are no witnesses and all that is left for Detective Lindsay Boxer is a cryptic message written in lipstick. The same night a famous actor’s wife is brutally shot in her bedroom in what appears to be a burglary gone wrong. Lindsay has her work cut out for her in trying to piece together the pieces to all the puzzles. With women and children being murdered throughout the city and multiple burglaries occurring, Lindsay has her work cut out for her in order to solve both cases before it’s too late. This is the ninth in the Women’s Murder Club series. Overall the book was good, but I really didn’t like how the book really revolved around Lindsay so much. I like the other characters in this book and there was just so little involvement with those supporting characters. The ending was interesting, it left a big question mark with me in terms of where the next book will take the WMC and it’s readers. In all honesty, I prefer the Alex Cross series to this one, but it’s still an interesting series. First Line: The old chrome-yellow school bus crawled south on Market Street at half past seven that May morning. The seemingly perfect murder has been committed in San Francisco. Isa and Ethan Bailey, young millionaires in the prime of their life have been found dead in their beds. How or why they have died is a mystery. Not even Claire can explain to her friend Detective Lindsay Boxer what happened to the Baileys. And as other young wealthy and healthy millionaires are dying in the same manner, they realize that they have to figure out what is killing these people and who and quickly. But as Lindsay is working that case, her friend, reporter Cindy Thomas, is on her about a homeless man, Bagman Jesus, who has been found murdered, shot brutally on the streets. But the man is not as saintly as his street name indicates. As Cindy works that case on her own, sparks begin to fly between Cindy and Lindsay’s partner, Rich Conklin. But as Lindsay and Rich get closer to the truth in the millionaire deaths, one of them will have a scare. First Line: Tiny lights winked on the Douglas fir standing tall and full in front of the picture window. The Women’s Murder Club is back! In this seventh installment of the series, Detective Lindsay Boxer is running two cases. The first is the missing teenage son of California’s ex-governer. He’s been missing for quite some time, and when the first break happens, it’s devastating. But at the same time, Lindsay and her partner, Rich, are also investigating some fatal fires. The fires are destroying some of San Francisco’s most beautiful homes. But as Lindsay starts to really get into the investigation, one fire rages way too close to home. I think I said this with the 6th book in this series – these books are getting so formulaic! I wasn’t going to read this one for a while, but the 8th in the series came up on my PBS wishlist and I accepted it and figured I would need to read this one first. I enjoyed it to a point, but I just keep wondering how far this series is really going to go. Personally, I’m not really seeing a whole lot of growth in the characters. Lindsay still hasn’t settled with Joe (although they have made big changes), Yuki and Cindy haven’t seemed to change at all, and all that’s happening with Claire is that she had a baby. There’s really no character development to me and that’s something that I really enjoy in a series. I’m going to read the 8th book since I already used a PBS credit for it and would like to get my credit back when I finish it, but if there’s a 9th I’m not sure I’ll be rushing to read it. First Line: A killer in waiting, Fred Brinkley slumps in the blue-upholstered banquette on the top deck of the ferry. A madman opens fire on a ferry as the boat is coming into the dock. Several people are dead, and one member of the Women’s Murder Club was injured. While Lindsay is hunting down the truth behind the ferry massacre, she is also having to deal with children of wealthy families being abducted. But the kidnappers are not contacting the families for ransom. Lindsay must deal with all of this and her personal life in order to figure everything out and bring peace back to San Francisco. Now don’t get me wrong. 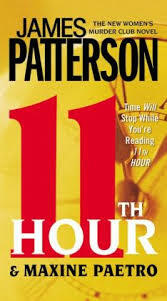 I really enjoy a good James Patterson book. However, his books are quite formulaic after a while. If you want a quick and easy read – this is it. However, there’s no “meat” to his stories. When I first started reading the Women’s Murder Club books I couldn’t get through them fast enough, but for some reason I’m hitting a slump with them. I mean it took me a week to read this book, I can usually knock out a Patterson is 2 days tops. I might have to give them a break for a while before picking up another one. First Line: Rain was drumming hard against the windows when the midnight-to-8:00 rounds began at San Francisco Municipal Hospital. People are dying at Municipal Hospital in San Francisco. It’s a hospital, of course people will die there. But doctors are stumped as to why there are recovering patients that are dying. People that should not be dying are dying. Lieutenant Lindsay Boxer becomes convinced that someone at the hospital is playing God. But the hospital is pulling out all the stops in order to protect its reputation. It will wage a court battle with the family members of twenty deceased patients. All the while, Lindsay and the Women’s Murder Club are hunting down a merciless killer. This one was okay. Definitely not the best in the series (that one still goes to the 3rd in my opinion) but I enjoyed it. As always, it was a quick and fun read with a lot of twists and turns along the way. And the ending was great!! I highly recommend this series to those who have not experienced it yet, I love it!! First Line: It was just before 4:00am on a weekday. Lieutenant Lindsay Boxer finds herself in the defendant’s seat after a short car chase which ends fatally. She retreats to her sister’s house for privacy before the trial is set to begin. There she is faced with a small town who is in the grips of a string of unsolved, grisly murders. Being the cop, she can’t leave things alone and gets involved. Not only is she facing financial ruin in San Francisco, but she is also facing a cold-blooded murderer who will stop at nothing to keep Lindsay from discovering the truth behind the murders. Another good book in the Women’s Murder Club!! This one was not as good as the 3rd Degree, which is the best in the series so far. The middle of this book was a little slow, but the ending … Oh My Goodness! It was a total shocker! I couldn’t believe it, I had no idea who the killer actually was!! I highly recommend this series! !